So, I’ve noticed alot of you have been asking Fil the same question that I had been for a while. ” What is the 50’s wiring you’ve been talking about?” Well here I’ll not only show you what it is, I’ll show you how to do it!!! In my research I found that there are more than one 50’s wiring styles. This one, however, is the most common and simple. This will be sort of a two part thing. I’ll show, in the simplest fashion, how to switch your existing wiring to the 50’s style. For me, this wasn’t enough. (I think we’ve learned I can’t leave things “stock” by now ) Next I’ll show how to do a complete “vintage” style rewire. To explain a little, newer Gibsons like mine (2006) come with thin wiring and VERY SMALL “pill” capacitors. Even after I switched my SG to the 50’s style it didn’t clean up as well as I’d heard and seen in Fil’s video’s. So, off to the guitar geek forums I went. (no offence, I’m one too 😉 ) It was then I found the problem. 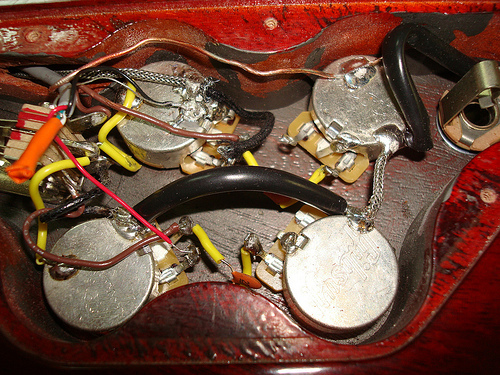 On top of the sub-quality wiring (as compared to true vintage) Gibson has been using different pot values in the more current Guitars. Mine tested out to be 4OOkΩ for tone pots and 3OOkΩ for volume. So I decided to do a complete rewire with 5OOkΩ pots, thicker cloth covered wire and a more vintage style Oil Filled capacitor. For those of you with even newer models (I believe ’08 and newer) it’s a different ball game. Gibson has been using printed circuit boards. I don’t know if it’s in all new models or just some but if you want the 50’s wiring I believe the complete rewire is the best option. Since I forgot to take a “before” picture of mine, here is my brother-in-law’s 2004 SG. Completely un-molested, stock Gibson new style wiring. Note that the capacitors connect to the same lug as the hot pickup wire on the volume pot. Here is my SG after I initially switched to 50’s wiring. Note the new position of the capacitor lead on the vol. pot. Moved to the center lug. So there’s the simple explanation. Easy as moving a single capicitor lead. Be very careful though. Those cap. leads bend and break very easily. Also be sure not to overheat the components. The rest of this article will be covering a complete re-wire for the more adventurous of us here. Here’s the basic tool set for this project. My soldering iron is an adjustable temp. iron. I recommend one like this. You can use the lower setting (20watt) for the smaller things that can easily overheat and the higher (50watt) for bigger things like pickup covers and pot grounds. You need the high heat for pots so you don’t have to heat the back so long that you boil the inside parts. IN-&-OUT fast is what you want. No matter what gauge solder you use it always should be 60/40 Rosin Core. I use the .032″ dia. A couple of quick terms for those new to soldering. TINING: Tining is the main prep for the soldering iron and the wire. For the iron: let it get to full temp and coat the tip with solder. For the wire: use the iron to heat the wire until the solder flows in easily. Tin ALL wires prior to soldering them into place. De-Solder:The blue tool above is a solder sucker. You NEVER want to reuse solder. This tool will quickly remove the old once heated. Heat Sink: An object, such as an alligator clip, installed between the solder point and the fragile component to absorb damaging heat during soldering. For those of you not wanting to hurt your finish this is a simple splat guard made from a cereal box. It only takes about 5 min. to make and install. So here’s one of the main goals to this rewire. Getting rid of these tiny ceramic pill caps. These are the main reason the “vol clean-up” wasn’t as expected. If your knobs don’t easily pull off try this. Any strong shoe string works. Also I recommend making a cover to protect the finish when removing the switch washer. After removal of the harness. If you are going to re-use any parts (switch, jack, ect…) de-solder them now and set them aside. Rather than do all of this heavy soldering in the small control cavity. I chose to make this simple template. I used my cavity cover for the outline and simply traced the hole locations. This can be made out of almost anything. I chose 1/4′ plywood for it’s similarity to the guitar material. Next is to mount your main pieces. Try to get them as close as you can to how they will sit in the cavity. Just use a LITTLEextra wiring to allow some adjustment when you install the harness. The first to do here is to solder the ground lugs to the pot back. Take some sandpaper to lightly sand the pot surface before soldering. This will give the solder more to grab on to. Here is the example of a heat sink. Placing the clip between the soldering point and the component will reduce the heat reaching the component. After the harness has been transferred to the control cavity tighten all of the components down into their final position. Last to do is solder in the pickups and ground wire. Congrats!!!! You’re done and ready to ROCK!!!! Here’s the before & after for my SG. These caps are oil filled and are specifically made to replicate the “bumblebee” caps used on vintage models. I took the opportunity to clean up my crappy wiring on the A.Y. Sig. tucking the unused coil-tap wires into the black sleeve. Here’s the before & after on the bro-in-law’s SG. These caps are a metal film. They are made as a direct replacement for the famous “mustard” caps. This is the diagram Fil led me to. You can find it at the following link along with some alternate ’50’s versions and others. This is another helpful link for wiring. Seymour Duncan. Many different combos. well i read all the input on this tread … came up with the one option that i could … well here it is …. 2017 SG Standred T Cherry Burst! … neck 57 Classic humbucker, Bridge 1966 original PAF Gibson Paton SG humbucker from a previous stolen SG that i owned …. including the white niolon tunamatic bridge. …. A upgrade ” (rsguitarworks.net) ventage prewired SG works” a sugestion from a previous post! playing through a 1976 “1959 100w Marshall plexi” including the Schaffer Replica Tower … .. OH! my Ears are still Ringing!!!! Thank-you Phil for your inspiration from all the work that you have done! This post is very well done! Thank you for the clear explainations! I think about upgrating my standard sg 2002 by rewiring it with this vintage style wiring, new pots and caps. Juste one question to understand my current wiring: i notice that it is similar to your initial 2004 sg wiring, which means that on the tone pots, the capacitors connect to an outside lug. Does this king of wiring correspond to the « modern wiring » we can see on many diagrams? I’m not a expert, but it seems no because on the modern wiring the capacitors connect to the middle lug. for some reason i can’t post pictures , but if you call ( 1-877-RSRELIC ) tech line … they can answer all your questions and even custom built you one and all you have to do is snap it in and solder the pickups. (comes with diagram instructions) I’m thinking of having them build one for a 2008 50th anniversary Flying V ..
Has anyone done this to their LP? And if so what difference did you notice? Do you still have independent use of all your controls? Rob, i’ve done this to my les paul. YES i have all the independent use of my controls, the only way you wouldn’t is if something was not wired properly. I notice a bit different in the overall taper and response of the volume and tone pots. Things clean up beautifully and i find you don’t have to turn your volume down to 3 to clean it up. It is more like you turn down to 7 or so to clean it up. Definitely a great modification to look into. Why Gibson stopped wiring their guitars this way, I’ll never know! Has anyone among the SoloDallas bretheren out there removed a PCB from a Gibson LP or SG? I want to install a 50s style wiring harness in a 2012 SG Standard and swap out the PCB and stock PUs, I’m curious as to how the PCB is fixed into the control cavity and how simple it is to remove it. All the Gibson’s I’ve owned in the past have been 70s/80s gtr builds, I’ve not encountered one of these PCB jobs and I’m not particularly enamoured with them tbh. Well, Fil told me he does NOT use 50s wiring in SGs, only in LPs. So I would just get a standard SG wiring kit like hat one fromRS Guitarworks. I’ve already got the parts sorted thanks; a 50’s wiring is schematic is my personal preference for this new SG; I’ve installed a couple of similar harness’s in the past in a Destroyer and SG using BKP CTS 550k pots (with audio tapers on the vol) and Lex Bumblebee and Jenson PIO caps respectively. It’s just the PCB I’m concerned about – I’m hoping it’s going to be straightforward enough to remove (bar the obvious pot, jack and toggle switch nuts) without having to contend with some type of Gibson retaining fixture or worse, adhesive. There should be no retainer clips other than the pot retainer nuts under the controls on the front of the guitar. I’m taking out the PUs and PCB assembly, so no need to clip the molex connectors – I’m going keep the stock parts intact just in case I ever sell it on etc. Got a BKP Riff Raff bridge and Mule to go in there, this puppy’s going to wail! Wow, something new here. I’ve always thought he was praising the 50’s wiring all the time. What changed? “50’s wiring” is what came stock on older Les Pauls. Gibson changed to “Modern Wiring” sometime during the 60s. Hence, most SGs originally had modern wiring instead. Thing is, LPs have a characteristic high end due to the maple top, so “50s wiring” would retain that even with the volume rolled back. With modern wiring, the added bassiness of its bigger body makes the sound “muddy” to most ears. On SGs, instead, it wouldn’t make such a difference because the small Mahogany body makes the sound a lot more midrange focused. Rolling back the volume with 50s wiring on a SG can make the sound a tad too thin if you are not careful (that’s what I think, at least – never tried it on mine, but I guess this is what would happen). 50’s wiring is not “the best”, just better suited on a few applications. i have some experience in both. I tried the 50s wiring in my SG and i must say there is a very very, almost unhearable, difference. In my opinion it is really not worth to try !! However, i changed the wiring to the standard modern wiring, much better ! Oh, and by the way, back then Gibson used 500k audio-taper (log) on both volume and tone. Current production models usually come with 300k linear on Vol. and 500k audio taper on Tone. I just got two CTS 500k log pots to replace the volume ones on my SG. Will report back when I make the swap. But as far as vintage tone goes, audio-taper. yes, that`s a thing what i have already done some time ago. The guitar got louder then, but if you turn the volume down the sound becomes mud, the highs are lost. I soldered a little capacitor on the volume log and the treble bleed was done Very easy ! Yes, indeed this is true. You lose significantly more treble when rolling down 500k volume pots vs 300k volume pots. I actually don’t like 500k pots on my SG (I’m using a 490R pickup in my bridge with an Alnico 5 magnet). With volume on 10 the sound is way too harsh and compressed in the high frequencies for AC/DC. And when I roll down to 7, I’ve lost way too much in the treble. For me 300K pots and modern wiring works perfectly well. It does make me wonder, what Angus used in the 70s. If he used stock wiring and pots, they were likely 500k on his older guitars (I think Gibson introduced 300k in 1973). as i wrote, you must not lose treble if you solder a littel capacitor on the volume log. I have done this and i don`t lose treble anymore if i roll back. What values have you settled on? Are you using 500K pot? And what size of cap? I’am not sure, who makes the absolutely best kit if one wants to completely rewire an SG? I got an Gibson SG Custom Shop tremolo SG (faded cherry and vibrato/maestro) and i’ve thought about rewiring it completely, using the best possible, i’am not sure who but i’d like to get as good as possible parts for this, 500k pots, bumblebee caps, 50s wiring, 4 conductor (2 tone/2 volume), i’am also gonna change pickups in future to a Texas bucker and a BBQ pickup in bridge, the hardware seems okey as it is but might change that as well in future, right now i need a complete wiring kit, and the best possible. Who makes the best? RS? Mojotone? Really want the pickups to have optimized signal and everything flowing and able to use the pickups knobs as great as possible without becoming muddy and stuff like that and being able to clean up to either drive more or less depending on the situation. Any advices on the perfect kit for this in mind? I’m not sure your “perfect kit” actually exists. I’m not sure who “RS” is???? What I can say is my suggestion would be to build your own. I like the idea of Mojo’s “premium” 500k pots because they’re guaranteed to be within a 1% tolerance. I used the Gibson “reissue” pots on my bro-in-laws SG Special(brown SG above) and they tested out to a 10%tolerance. If you are after Bumblebee caps I don’t think you’ll find a kit (pre-built or not) at all…… The only 2 places I can even find these to buy new are Guitar Center and Gibson’s site stores. AND YOU’LL PAY FOR THEM!!!! To the tune of about $125 a pair if I remember right. I think if you’re going to go reissue the Mojo Vitamin-T’s would be way more cost affective ($4.50 ea. I think) and they were made to replicate the bumblebee in the first place. These are what I put in my SG (Red Standard above) and I have no problems with mud or going from dirty to clean in a single swoop of the volume. I know I seem to pimp the Mojo stuff but I really haven’t used anything else but the T’s the Dijon(for bro in law) and orange drops (for a friends Les Paul) Out of these 3 setups I liked mine the best. Mine is Mojo’s “classic” cloth covered wireing as well. I bought it in longer lengths and cut to fot on my own. Any more ?’s feel free to ask away!!! Dunno what else i should say really, been up all this night so i’am not thinking that good either. I know 500k pots are required for the 50’s wiring. But there are two different types of pots. The resistance changes either linear or logarithmic by turning. Very often linear pots are predestinated for volume control and the logaritmic ones for tone control. But how is it in the 50’s wiring? I don’t know how it was in the ’50, but I tried Log on volume with the ’50 wiring and I didn’t found that well. The sound passes too fast of overdrive in clean (10 to 6). I ‘m going to put back Lin on volume. It’s an important question for me which types of pots (logarithmic or linear) are used in an original 50’s wiring, because I want to make my 61′ reissue as original as possible. Fil, do you know which type of pots are in our guitars. Sorry. I’ve been away for a while. Busy……..
Great article, and very helpful links! Going to rewire one of my SG’s now. By the way, is the Chevy Nova in your flickr gallery yours? I’ve had it for 9 years next month. It’s my baby. Unfortunately, due to economy/financial reasons I’m kinda trying to sell it. Back on subject. Glad you liked the article. Good luck with the rewire!!!! I would like to change my SG’s wiring too ! But, I read that it is also better to change the pots by CTS 500K pots. Is it true ? What kind of pots should I use, Audio, Linear and in wich position (Audio on Volume and Linear on Tone …etc ?) ? I think no matter what you do boils down to personal preference. I went through 3 sets of capacitors before I found the ones I like. One of the sets I didn’t like I put in my Brother-in-Law’s SG because he did like them. Thank you very much of your answer ! If I wonder what kind of pots to use it’s because when Fil say “this song is played with the volume on 7″ (for exemple), it is different if the pots are Audio or Linear. Concerning capacitor, I use Russian PIO (K40Y-9 from old military stock). It would seem that these capacitor are the same that the “famous” Bumblebee, just a different design. And it is less expensive than the Bumblebee Reissue. I don’t feel at ease with SG’s wiring and their narrow cavities (I prefer work on Strat). I’ve never found in any of my research that Gibson ever used Audio pots. At least on Standard LP’s or SG’s. I’ve seen many vintage harnesses and they are all Linear. So I would tend to believe that Fil’s guitars are linear as well. Actually, Gibson SG Standard stock pots seems to be 300K Linear on volume and 500K Audio on Tone (that’s the replacement parts proposed by Gibson and even the Angus Young Signature SG is too). In my research I could read on a website that Gibson have used Audio taper pots, CTS pots made by Centralab and they are very different from those made actually . It explains the difference between old and new pots production and why to use Linear or Audio pots. I don’t know for the SG, but the vintage Les Paul were wired with four 500K Audio pots (the actual Historic Reissue too). I didn’t find precision about vintage SG’s wiring (and it’s difficult because of my level in English, the good informations are rarely on french website …). I think it’s possible that Gibson didn’t change the pots value trough the years, maybe it’s due to the big tolerance on the value of the nex production’s pots, ? I propably will re-wired my SG with 500K CTS pots, Lin on volume and Audio on Tone, in the end the value is the more important detail. It would be more easy if Fil could say to us what kind of pots are wired in his SG Possible ? It appears we both are right to a certain degree. Further reasearch might be required. There is also a schematic page in Gibson Tech Support showing many Gibson’s with many different pot values. I know that the spec for my ’06 is 250 vol. 300 tone. That’s exactly what I am looking for. But it’s difficult to find it in France. Some shop in other country sell that kind of pots, and custom made pots (RS Guitarworks, Bareknuckle, Single Coil etc) but the postage is expensive compare to the price of the pots. It belongs to me to thank you for helping me on that subject. Yes, is definitely a great article, nice and clear. It addresses a subject I have been interested in for a while. I’m trying to turn my 1996 Gibson SG into a copy of the 1970 model. More specifically Angus Young’s 1970 SG. Would this be the kind of wiring his would have had, or would his have used whatever the stock wiring was in 1970? Or was this the kind of wiring Gibson SGs had in 1970? Anyway much thanks to 06AngusSG for writing this excellent article. I kind of did an “Angus” conversion on my ’06 SG you see in the post here. As far as the wiring in Angus’ SG’s go, from some of the articles Fil (and others) have posted here, it seems that he has went through several changes. From stock to hardwiring hie wireless transmitter to surley many others over the years. I’m not sure when Gibson switched away from the 50’s wiring style but I believe by the late 60’s it was already gone. Here is one of Fil’s late 60’s – early 70’s SG’s cavitys. I only became turned on to the 50’s wiring after watching Fil’s youtube videos and his comments about it. Regardless of what Angus actually uses, if you were to do the switch I don’t think you would regret it. Cool I think I may attempt this some day. Are those CTS brand pots you switched to when you went to the 50’s wiring? And I noticed in your photos you have the Grover tuners, they look really good. I just changed to Grovers, but the screw holes on the tuners only line up about half way with the old screw holes. I think I might fill them and redrill them. Is this something you had to do? Yep. Pots are CTS. Bought them through Mojo music supply. My Grovers lined up perfectly with the existing. No drilling required. Sorry about your luck though. I would suggest trying to install a is first. If it doesn’t work then go the f fill & drill. Sorry for all the questions but are your Grovers the full size, mid-size, or mini kind? I wonder if that would make a difference in how the holes line up. And are those Gibson brand knob pointers or are they replicas? No problem on the questions. My Grovers are the Full Size 18:1 gear ratio. Medium and small Grovers screw hole comes down diagonally off of the casing. Entirely different than full size. Did you try installing them yet? The pointers I bought at a small local repair shop. I honestly have no Idea if they’re Gibson or not. I did have to flatten and re-bend them to fit the whitch-hat knobs though. I think they were designed for the bell knobs which are a little smaller. They can also be found at the site linked above. Feel free to ask anymore questions. Really not a problem. Also, are your CTS pots “audio taper” or “linear”? And long shaft or short shaft? I think these are the last of my questions haha. It is a mystery as to why your holes would line different. Hmmm…….? That method in the link seems pretty good. The only thing I would add is some fine sawdust or bone dust to the mix for some structural integrity. My pots are short shaft audio taper. Mine lined up exactly with the stock holes. I honestly don’t know which version I have other than they are full size 18:1. The shop I bought them in had them as an un-packaged return (because of not fitting right 😉 ) so I got a big discount. The next time I do a string change I could take one off to do some measurements/ pics if you want??? That would be very helpful. Thank you very much. It doesn’t make sense to my why they wouldn’t find a way to accommodate the angle on large guard SG’s either. Thanks for getting back to me! I think I’ll do the same with mine. It bugs the hell out of when I look at it and see the space! lol I think it’ll actually sound better too since the pickup will “pick up” evenly. I’ve also ordered parts to do the 50’s wiring and am installing a treble bleed kit as well. I realized last night that I am possibly the worst solderer there ever was and leave these ugly globs everywhere (as well as cold solders I suspect), so I think I’ll bring it to my amp guy who is an f’n surgeon when it comes to electronics and the likes. He’ll fix her up for me neat and tidy! Don’t wory about the soldering. It takes practice like anything else. I learned in an electronics class in H.S. Good luck with the wiring. Here is the link to the wiring diagrams. This is the third picture down ‘Modern Wiring’. I have recently moved the cap connections from the red to the yellow on the volume pots as in the top drawing ’50’s wiring’. This reduces muddiness in tone when rolling off the volume, the wiring must have changed during the mid 60’s, hope this helps. Interesting, and thanks this is all very helpful. what are the benefits or 50s wiring? The main benefit is the clean-up you get with vol. roll off. Also it makes the tone knob actually useable. You can roll the tone down w/o getting the crappy muffled sound. Excellent 10/10 ! My ’70 SG has what is termed the modern wiring as standard, I have moved the cap connection from the pick-up hot wire to the centre lug on the bridge and it has made a noticable difference for the better. One side effect of this though is that the pick-up now only works with the selector switch in the treble position and not centre. This doesn’t bother me but I was wondering if I should make any other wiring changes? I also have a pile of srague orange drops of varying values, was wondering about trying these across the volume pot. I can see the mustard caps are .22mF, what value are the bumble bees, the same? Also I thought the neck pick-up cap was around .15mF are you using both at .22mF? Yes Rob, the Vitamin T’s are also .22nf (or as they rate them .022uf). My stock little pill caps were both labled the same with 223 on the face…hmmm? 😉 Don’t know what their actual value is but I’m assuming equal to each other. and some of the conversations I read in the Les Paul forum pages when doing my research. Basically the higher the value the faster the treble will Roll off. For the wiring. I would have to see a pic of yours to give a def. answer. At the link to the LP forum on of the 50’s wirings is for independant vol. Allowing to completely turn down either pickup in the center switch position. Is this what yours is diong. Or does the neck pickup not work at all in the center? Sorry for the lengthy reply. Thanks for the reply Jon, great info, just looking at availability of Mojo caps. I am an electrician so cct changes are no problem. Re: my SG , all I did was move the bridge cct cap leg from the outer to the centre lug on the volume pot. The tone is less muddy when rolling off but the bridge pick up no longer works in the centre position. Obviously I’ve checked that I didn’t accidently affect any other wiring. The neck pick up cct is untouched and still works both centre and rhythm. the bridge p.u was definitely working centre and treble. I’m wondering if moving the cap connection has this side effect? I never play with the centre selected so I’m not bothered. I plan on changing both caps from those ceramic discs anyway so will find out if this also happens when I move the neck cap connection. O.k. That all makes sense now. If you only moved the one lead for the bridge side then the circuit would not be completed right in the center position. I have no corrrect terms or theory behind this but I pretty sure if you were to move the neck lead over it would work as before. Good luck with whatever new caps you end up with!!!! Thanx. I use Stew Mac for some of my parts. I do know about those tools, just don’t really want to buy them. Not unless I get into frequent repair work. Nice work! This site gets more and more helpfull by the day! I agree, very good detail, like how the those card cutouts were also added to protect the guitar. I think anyone with some simple soldering skills can do this, an soldering is not that hard to learn really, even for someone who has never tried it. Fil, the 61 reissue will that already have 50’s style wiring or will Gibson have put in the modern style? Modern style I am afraid. Also I’ve done a little digging about different Gibson stock wiring. ’08 and newer is the printed circuit. Exception being the VOS and all custom shop stuff. Though I can’t say I could justify the cost. 😉 I don’t know how the price compares to buying a set of originals either. My Gibson SG ’61 reissue (not the custom shop model) was made in 2009 and “she” has still the regular hardwiring like yours, but with the modern and not with the 50s syle wiring. Thank you for clearing that one. I wasn’t sure for the ’61’s. So I’m also guessing it’s not their new “historic” stuff? Very cool tutorial. I like the template a lot. Such things tell the true handcrafters apart from the tinkerers. Unfortunately I have a SG with a printed curcuit board, so that will be a bit more work, I’ll keep this up for later. Thanks for this great posting! I agree with Dave, this is terrific and excellently done. I don’t want to be here for any kind of recognition. Just want to make what contribution I can to this great learning site. I wandered through forum after forum trying to find the actual “50’s” wiring before Fil sent me to the LesPaul forum linked in the post. Thought I’d make a “short cut” for the rest of the guys who want it here.